Increase in atmospheric CO2 from 1960 to 2010, [Wikipedia]. The flow of CO2 from the atmosphere and rivers into the ocean. 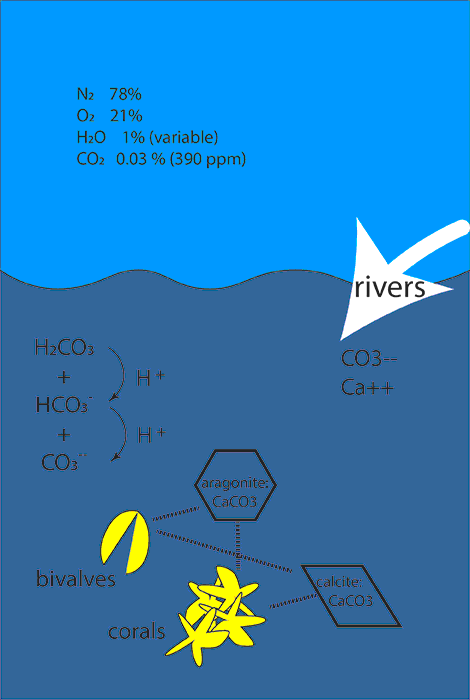 In the ocean CO2 is in equilibrium with carbonate and bicarbonate. Carbonate combines with calcium ions to form crystals of aragonite and calcite. The equilibrium between these species is dependent on pH. This month's essay was motivated by two articles in the July 13th, 2012 issue of Science. The first, "Rising acidity brings an ocean of trouble" , is a summary of the problem: people have burned so much carbon (fossil fuels) in the last 100 years that the resulting carbon dioxide in the atmosphere has increased the acidity of the oceans which impares the ability of marine organisms to produce calcium carbonate shells. The second article  makes predictions for the future acidity of the West coast of North America. The chemistry is a little complicated. Carbon dioxide in the atmosphere is in (approximate) equilibrium with carbon dioxide dissolved in the ocean surface. However, the dissolved carbon dioxide reacts with water molecules to form carbonic acid, which dissociates to produce bi-carbonate and carbonate ions, releasing hydrogen ions (acid) in the process. The ratio of these ions depends on temperature and other factors. Deep ocean water is colder and is often not in equilibrium with the present atmosphere. Thus, variable upwelling of deep water can cause significant variability in the acidity and chemical composition of ocean shallow waters. The carbon dioxide concentration in the atmosphere has increased from about 280 parts per million (ppm) before the industrial revolution to 390 ppm today. Very accurate measurements are available for the last 50 years, and they show an accelerating increase of about 2 ppm each year at the present time (see graph upper right). The increase is completely consistant with the amount of fossil fuel burned, which is also still accelerating. Acidity of the ocean (and other liquids) is usually expressed as pH, which is the negative logarithm (to the base 10) of the hydrogen ion concentration. The pH of the ocean has decreased by about 0.1 pH unit. This corresponds to an increase in H+ of about 25 percent. This may not seem large, but it has a significant effect on the stability of some solid forms of calcium carbonate, which form the shells and skeletons of many marine organisms. Some marine organisms use silicon to fabricate shells and skeletons, e.g. diatoms, but most employ calcium carbonate. The shells of mollusks and corals are composed of micro-crystals of calcium carbonate in a protein matrix. There are two types of crystals, calcite, which has a rhomboidal symmetry, and aragonite, which has a hexagonal symmetry. Even though both are made of Ca and CO3 units, since the physical arrangement is different, the stability at higher pH is different. Aragonite is the least stable at higher pH. The first article  describes the problems an oyster farm on Netarts Bay Oregon is having with ocean acidification. After several years of searching for the cause of low yields of oyster survival, they identified pH (and the resulting solubility of aragonite) as the problem. They realized that failure of oyster larvae survival was correlated with the upwelling of deep, cold water with high CO2 levels. Their only solution was to control the flow of water into their oyster beds so this high CO2 water excluded. The second paper  models the decreasing pH along the West coast of the United States. It concludes that by the year 2050 more than half of the coast will be undersaturated with respect to aragonite, and in the next 20-30 years the entire coast will be in this state. Unfortunately these articles are not "open access", so you must have a subscription to Science, or access to a library that has one, or wait 6 months after the publication date to get access to the entire contents.